During my Friday Keynote at the PNPSummit I did a silly 30 minute PowerPoint that ended with some LOLCats and a few examples of LOLCode. If you're not familiar with LOLCats, they are basically silly pictures of cats that speak a l33tspeak-like language, like IM IN UR BASE KILLIN YUR D00DS. This language has turned into a Programming Language called LOLCode for which there are already at least TWO .NET implementations. The first implementation of LOLCode.NET is up on Google Code and is by Nick Johnson. During my talk, unbeknownst to me, literally that minute John Lam was uploading the DLR team's own implementation of LOLCode implemented from scratch on the DLR. The amazing Martin Maly of the DLR team implemented LOLCode on his plane ride to Spain for presentation at TechEd. I invited John up on stage spontaneously to give a demo of LOLCode and he did...he showed a Fibonacci implementation. This is great code to read for two reasons. It's two completely separate implementations of the same general idea - an LOLCode compiler. However, they are implemented completely differently. Of course, the DLR team images this as a Dynamic Language so their implementation is a great primer on how to make your own language on the DLR. 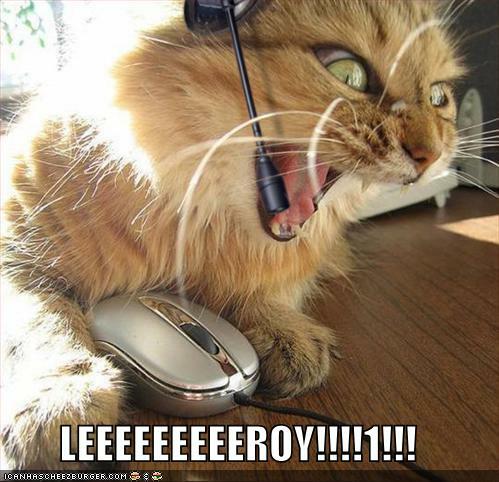 I HAS A CODE ITZ "CRAZY"
COL Add ON HT WIT "LolCode" AN "Rulezz!!" 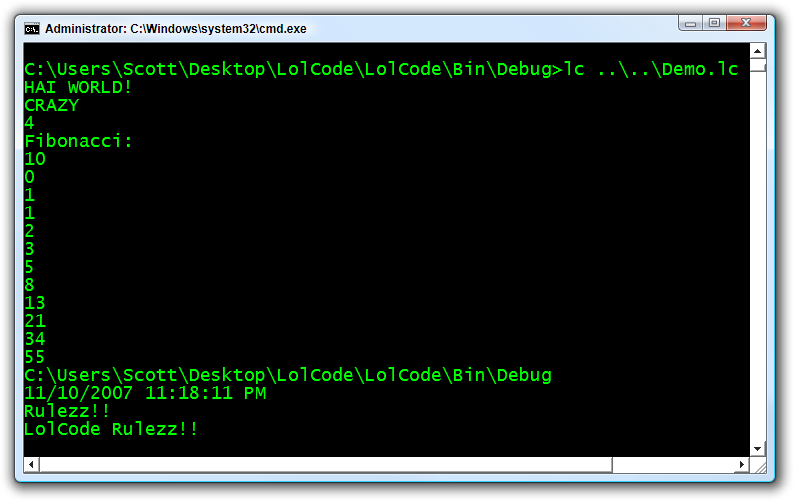 VISIBLE COL get_Item ON HT WIT "LolCode"
COL Concat ON String ON System WIT "LolCode " AN "Rulezz!!" These are kind of Lex and Yacc for C#. Open up the Parser.y and Scanner.l to see the language grammar details. Confirm the PostBuild steps point to the right locations and make sure the Microsoft.Scripting.dll reference points to the Microsoft.Scripting.dll from the IronPython download. Enjoy! If you don't think this is fun, go play with the MVC Demo Source Code from DevConnections and the PNPSummit. I am very happy about that and I am eager to learn the .net course through mails like this.....please send me the material of .net. I know LOLCode is a fairly simple language, but that's still impressive! I think the cat's yelling at Leroy Jenkins, not worrying about whether Taimak's got the glow on him or whose Converse it'll have to kiss. When cultural ephemera clash, everybody wins. Scott, thanks for the LOLCODE mention. Martin Maly has contributed further details on behind the scenes implementation details at the LOLCODE site. lolcats and fibonacci, not sure what to say to that, but thanks for posting something to make me laugh!